Clocktower Cameras is one of a dying breed: a ‘proper camera shop’. You step through the door and find yourself surrounded floor to ceiling by tripods, camera bags, lens caps, second hand SLRs, straps, film and even the odd selfie stick. Since they opened 20 years ago, Internet shopping has been the biggest obstacle Ed and Paul have had to overcome. “We’ve been hit hard by the Internet. Luckily we’re very specialist. We’ve made a name for ourselves by being different. We have an olde-worlde thing going on – both with shop and staff,” Ed laughs. And it’s true. It’s this ‘treasure-trove’ feeling that differentiates Clocktower from its local competitors – namely Park Cameras in Burgess Hill. While Park Cameras has a large, modern retail space with a wide variety of new stock from major photographic brands, at Clocktower Cameras there is a sense that you can dive in and find anything from any era. For keen photographers, this is a real draw. Photography is by nature a ‘gadgety’ hobby. As your skills improve, you realise you need the technology to take you to the next level. There is a collectors appeal: a desire to build collections and buy all the components. This is what keeps customers coming back to Clock Tower Cameras – they appreciate the advice from Paul and Ed and, often, just want to wax lyrical about their favourite pastime. I overhear one of the customers in the shop say she’s looking for black and white film, as she couldn’t find any in Birmingham. Ed locates the product effortlessly from the shelf behind him and makes the sale. With Brighton University and City College Brighton & Hove just around the corner, the shop regularly attracts students looking for film cameras and supplies. This year the pair are celebrating their 20th year in business – impressive for an industry that’s seen some huge changes in that time. They met at their previous jobs, working at City Camera Exchange which used to be located on Brighton’s Western Road. “I learnt so much working at City Camera Exchange,” Paul says. “I learnt more there than I did working as a photographer’s assistant, just because of all the questions the customers would ask. It meant I had to know the products through and through. Knowledge is the key. Ed went on to study design at University, while Paul studied sculpture at Kingston. 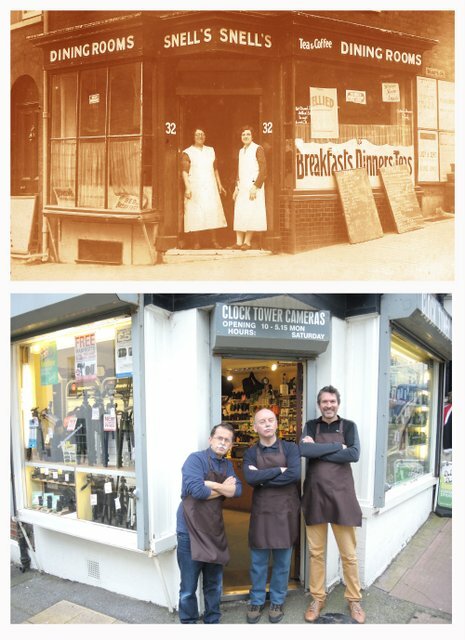 The first shop they bought together was located by the iconic clock tower in Brighton’s city centre, hence the name of the business. They tell me it was much smaller than their current shop but due to its central location, had a greater footfall. “It’s weird – even though we had more people coming into the shop when it was opposite the clock tower, the business is doing much better now,” Ed says. Four years ago, the shop moved to its current location on Church Street, tucked away from the main road leading from the railway station. There used to be a Jessops store just around the corner, but the partners insist the proximity was actually good for business. In fact their first employee, Shaun Hamlin, came to the business directly from Jessops. I notice on the counter there’s an old sepia photograph of what I assume to be the exterior of the shop when it was a tea-room called Snell’s Snell’s. You don’t get that from an Internet shop. When you own a physical, bricks and mortar shop, you’re not just selling products: you are joining and serving a community that has a heritage. Brighton is a unique city in that 70% of the shops here are independently run. Ed adds that their customers are fantastic ‘99.9% of the time’. I’m interested to know how another emerging technological trend has affected their business: smartphone photography. “It doesn’t affect us too much because we mostly sell second hand DSLRs, lenses, filters and accessories. But over Christmas I think we sold about two compact digital cameras,” Ed jokes. It’s clear that the pair understand their market. There’s no snobbery, no bias: they stock what their customers want. He tells me that reps come to the shop every six weeks or so to show them products. Today the shop thrives. For the short time I’m in there, there is near enough a steady stream of customers coming in, asking for advice and leaving happy, product in hand. I think their success is down to a mix of being located in artistic, laid-back, liberal-minded Brighton, and their own business sense and optimism. Here’s to the next 20 years!